With a growing flock of chickens, we never have a shortage of fresh eggs to use up. One of our favorite super easy ways to sneak eggs in as a side item for most any meal is by making popovers. Ahhh, popovers. Light and airy and just perfect little puffs of magical love. They are easy to pass off as something you slaved over in the kitchen, but in all honesty, it doesn't get much simpler. Popovers are rumored to be the American version of England's Yorkshire Pudding, although some argue it happened the other way around. Either way, they get their name from the way they bake and fill with air, puffing up over the sides of the muffin tin, creating a hollow mountain of a egg rich roll. Typically served plain or wth herbs, we've learned by experiment that you can add pretty much anything you darn well want right before you bake it... creating endless options to serve any time of the day. The following recipe is an adaptation of several recipes I have come across over the years. Preheat oven to 375 degrees. First off, if you're using regular metal muffin tins, generously butter them. These babies WILL stick if you're not careful. 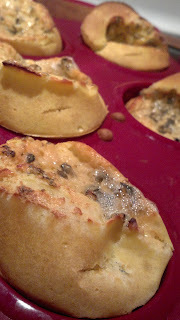 However, if you have them, I highly recommend ruling out this issue by using silicone muffin pans. No butter needed. Next, beat eggs and mix/whisk in milk, flour and salt. Batter will be thin. Fill muffin tins half full with batter. You could stop here, toss them in the oven for 35 minutes, and call it a day. OR, you can dress them up at this point... a teaspoon of your favorite jam dropped on the top of each one, or (my favorite, pictured above) some blue cheese crumbles. Be creative. Depending on the topping you choose, it will create a different baking effect, but the end results have never disappointed us. Jams and jellies tend to turn into a glaze that creates a big hole in the middle; cheeses make the tops look like the Grand Canyon. Either way, when the buzzer goes off at 35 minutes, open the oven door and quickly pierce each one with a steak knife to let any trapped steam out. Then take out and let cool for a moment before devouring.